According to Siri, it’s 9 degrees today which feels positively balmy after last week. Is winter over? I hope so, I’m soo fed up of all this greyness outside (which is a bit ironic, as I love grey for pretty much everything inside). Ethan keeps asking me when Spring will be here. He’s desperate to get outside and play, and I don’t blame him! We’re all feeling a bit Vitamin D deficient at the moment. Kids (and grown-ups) love to spend time outside, and it’s so good for us too. There are so many benefits, mental and physical, to being outside in the fresh air. If your little ones are anything like Ethan, they will spend hours in the garden. Despite our garden being on the small side, he still absolutely loves it and can happily spend all day out there. Towards the end of February is a good time to start thinking about preparing your garden for Spring. Here are a few tips on how to get started. Generally, over the winter, your garden will look a bit blah. It’ll be muddy, dirty and probably covered in pesky weeds. Time to pull on the gardening gloves and have a good old clear out. This is very physical work and requires a bit of strength and stamina. If you have a dodgy back like me, it’s probably a good idea to hire someone to help with garden clearance. They can take away things like garden refuse, old bits of wood, unwanted garden furniture, and general waste, without you doing yourself an injury! This should leave you with a nice clear garden. You’ll finally be able to see what you’ve got to work with. By nature, these tend to get very dirty. It’s a good idea to clean them before you store them for winter. If they’re looking a bit tired, it’s time to give them a bit of TLC. Give them a good clean and a scrub in soap and water – washing up liquid would work well. 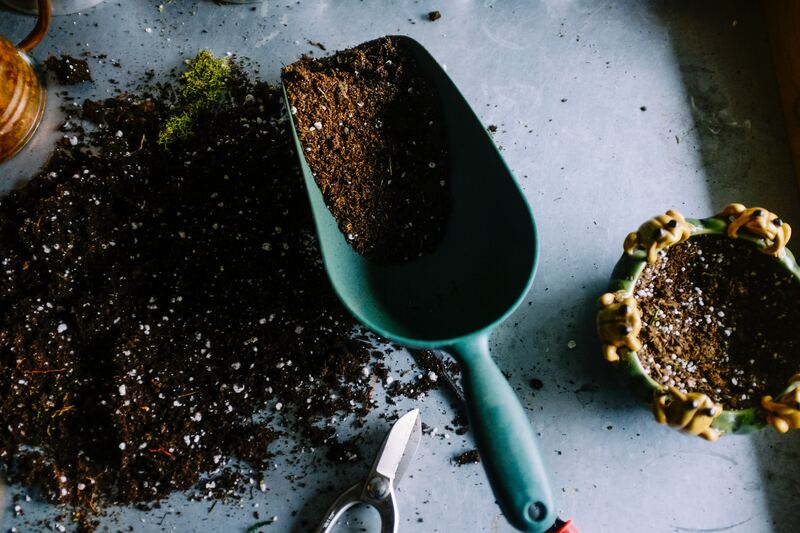 While it’s a bit too early to start planting, it’s a good idea to prep your soil and make sure it’s ready. Get rid of those ugly weeds and add some fresh compost in to boost the nutrients in the soil. Use a good pitchfork to turn the soil over to freshen it up, and mix it in well with the compost. Hubby really enjoys planning our garden. We’re moving home this summer and he is already sketching out design ideas. This time, he has a bit more space to play with, which is great. The layout of your garden is important. Do you have an area for seating? A barbecue? Grass for the kids to play on? A sheltered area? Consider which way your garden faces and make sure your plan makes the most of the sun. The next part of your plan is choosing which flowers and plants will go where, and when they should be planted. I don’t profess to know very much about plants – I tend to ask my Mum who is a fountain of knowledge of all things garden-related. You could head to a local garden centre – their experts should be able to advise you. Consider types of plant, colours and of course the height – this will really affect the overall look of your garden. Once you have your garden looking awesome, you need to invest some time in maintaining it. After all this work, it would be a real shame to neglect it now. Gardens do require quite a bit of attention to keep them looking their best. If you just don’t have the time or inclination, you could consider hiring a gardener to help you maintain your garden. A gardener will keep your garden looking tidy and in tip top condition all year round, so it could be a wise investment. Do you love gardening? Please share your best gardening tip with us in the comments below. Disclaimer: This post is in collaboration with GetAGardener. All words and opinions are my own.